London industrial designers Priestmangoode propose hospital wards modelled on health spas and beds like those in first class airline cabins in a new manifesto for health service design, released today. The report, written by Priestmangoode and called The Health Manifesto, looks at how better design could help produce better, more efficient and more cost-effective environments for patient recovery. One of the ideas is the Recovery Lounge, a ward where people can recover from minor operations (shown here) that borrows ideas from the hotel and airline industries. A PDF version of The Health Manifesto can be downloaded here. Update 17/05/10: watch a movie about the project here. It may look more like a health spa but this sophisticated lounge could be the future of our hospital wards according to Priestmangoode. 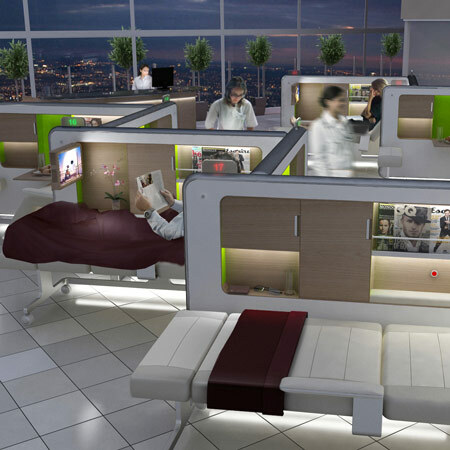 In the week that the group won two major awards for their work reinventing the economy hotel room and designing luxury First Class airline cabins, its vision for a hospital recovery room uses the same design principles to create a concept which Priestmangoode believes could take the strain off the queues for hospital beds and help the NHS save money. The Priestmangoode Recovery Lounge is a concept for patients recovering from minor operations and procedures. The designers say that its clever design could help speed up patient turnaround times, improve cleanliness, take the strain off over-stretched nursing staff and ultimately help hospitals run faster and more effectively. staggered layout, much like those in First Class airline cabins, meaning more beds per sq/m and allowing nursing staff (like cabin staff) a clear line of sight to everyone, improving staff efficiency and cutting down the number of nurses required. individual private patient zones, designed to offer maximum comfort to the patient whilst incorporating clever design solutions to improve cleanliness and turnaround times for e.g. furniture floats above the floor to avoid dirt catching in hard to reach crevices and joints and corners are rounded off making them quicker and easier to clean (the designers did a time test to prove the significant amount of time saved cleaning round corners instead of square). an adaptable bed inspired by airline seats and offering three positions (lie-flat, relaxed and upright) at the touch of a button so that patients can choose the position most comfortable for them, improving their sense of well-being and encouraging faster recovery. a modular design allowing each zone to be manufactured off site, lowering production costs and allowing quick, easy installation in both new and existing hospitals. The Recovery Lounge is part of a manifesto published this week by Priestmangoode which aims to show how clever design thinking could address some of the most pressing issues within the NHS.